It’s not easy to find the perfect gifts. Most gifts are a good guess unless the recipient it is being given to has a special list of items they would like. This is why Christmas themed gifts are a good solution. It takes the focus off of whether or not you’re giving the right gift and reminds the person who’s receiving the gift what truly matters when it comes to the holiday. There’s nothing like creating a special memory. This photo ornament is unforgettable for new parents. When you’re a new parent, you can never have too many photos of your baby. That’s why photo ornaments (as pictured above) are an impressive choice. The one featured is printed on ceramic, which won’t fade with time. 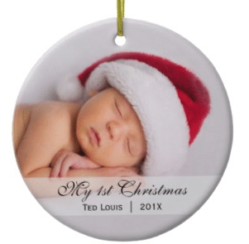 This two-sided ornament can have photos, text or a special message put on it. Even better, it shows that the giver went the extra mile and parents will be able to reminisce each time they put up the Christmas tree. It’s a meaningful gift that will last for years to come. Available for under $20.00, these make an ideal stocking stuffer or you can give them as a set too. This angel orchestra set is no small feat. 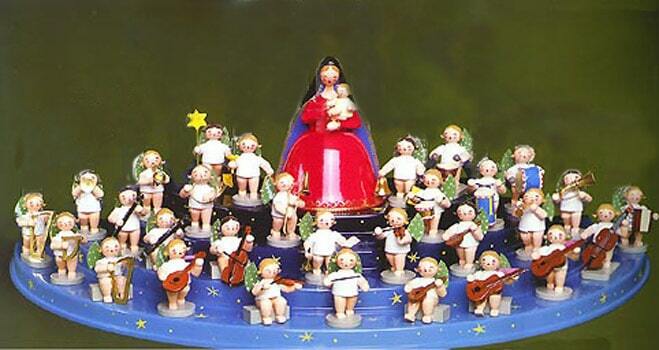 Handcrafted in Germany in 1915 by Margarethe Wendt and Margarethe Kuehn, they figurines have become highly sought-after by many collectors. The folk art quality shows handcrafted touches at its finest as it is made with wood. Pieces start at $26 and can easily go above $150. Some pieces are embellished in gold, which makes them a little more expensive. With gifts like these, they can sell out quickly, so it’s wise to buy in advance. 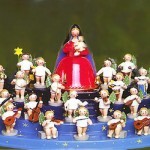 All in all, considering a Christmas gift that showcases Christmas is sure to please those who truly embrace the season.